Sept 27th is the longest day of 2010. It is the first day after elk season, and the first day we have to wait for the next one...I hate it. This has been one of the best hunting years in memory for ourselves and our customers. NOT because of how good the hunting action was, just because so many connected on bulls - and nice bulls at that. I don't remember a year when my customers did so well, or my own personal hunting partners. Even with all the success it was a tough season. Those animals came with lots and lots of hard work. Neither my brother Danny or I killed an elk this season but it will still go down as one of the best. Let me tell you about my brother-in-law, Kelly. Nine years ago I was a freshmen in college and my sister called me to say hey. My roommate and wrestling teammate answered my phone thinking he was going to be funny and talk to my little sister. Joke was on him because 5 years later they got married. Kelly is a super competitive guy, like me, so we are always finding something to best each other at. He never had any interest in hunting. The year after we graduated college we were both still living in Wisconsin and I killed a big whitetail buck. For some reason that piqued Kelly's interest in hunting and he said he wanted to start hunting to kill a bigger deer than me. Two years ago we all moved to Colorado, my home state, and Kelly got really interested in traditional archery. My Dad and our good friend chipped in and got him a Wapiti recurve. He was so excited that he had to shoot it right away because he thought that that might be what it was like to shoot at an animal. Since then Kelly has had the fire for traditional archery as much as anybody. He shoots daily and makes his own arrows, from the crown dip to the cresting. We showed him how to mount his broadheads a few weeks ago, which I guess is about the final step in preparation. This was his first hunting season in his life and he started with traditional archery. Earlier this spring I got to watch Kelly miss a few turkeys in Nebraska (story here). There's nothing like being with somebody when they get those first hunting shots. He was devastated for missing and started to understand the excitement that keeps us all coming back to the field. Kelly finally got to go elk hunting with Danny and our good friend, and elk killing machine, Del Jolly. Del and Danny are two of the finest elk hunters out there, thanks in large part to the fact that they have the legs to cover more distance than any person I've hunted with. So Kelly was getting an introduction not only to elk hunting, but to misery like you cannot experience unless chasing elk in the Rocky Mountains (especially with Danny and Del). Del, Danny, Kelly, and Jared Hammen packed 6miles into the wilderness to their spike camp. Jared is an exciting UFC fighter but did not carry a bow on this trip, he was just there for the beautiful view, clean air, and awesome experience. Early in the hunt they came across this magnificent bull grazing in an open meadow. He had no cows and paid little attention to the bugling going on around him. Del is pretty picky on shooting an elk, which is why he's known around here as an elk snob. Usually small bulls and cows are not worth all the effort he puts into getting in the back country. But with three days left in the season and this cow at 12 yards Del decided he'd like to try and eat something a little more tender this year. Del has some very unconventional elk hunting methods. With a cow and calf feeding nearby and a bull bugling in the distance Danny and Del had a bit of a miscommunication. Danny told Del to "shoot that cow". Del thought that Danny said to "shoo" that cow, like shoo it away. So Del took off running at the cow, thinking that by splitting up the herd they could call in the bull. Danny and Kelly watched in horror as a few of the elk turned inside-out running away. But Danny immediately started calling, which to his surprise and Del's plan, the majority of the herd ran right to them. Del shot this cow and then dodged out of the way of other elk running into them, at one point using his bow to poke one that tried to run through him. The following day Danny, Del and Kelly made a hike that would put most hunters 6 feet under. On their way out of Diablo Bowl (as Del fittingly named this hellish bowl) they came across a small herd. A few of the cows walked along the edge of a cliff just 12 yards from Kelly. Drawing his bow on a big game animal for the first time, and sure of his skill at that distance, Kelly did what ALL of us have done at one point or another - he shot right over her back. His arrow kept on sailing off that cliff and out into the wilderness. A mistake which he would be thankful for in another 24 hours. On the final evening of their hunt Danny and Kelly put on a monster all-day hike. Later in the evening they heard a bugle towards camp, and the wind was perfect. Luck was on their side that night. Sneaking as close as they could they spotted a big herd out in the open. Elk were running everywhere, making every noise an elk makes, and doing all the cool things that elk do. Kelly got to see the herd bull do everything and make every noise that they make for almost an hour. With shooting hours winding down they feared ambushing these elk would run them out of time. Danny picked up his call and this big bull came in looking for blood (or love, either one he wanted RIGHT NOW). Kelly was drawn on a cow, but not knowing where Danny was exactly he did not shoot. As soon as he let down this bull ripped off the loudest, nastiest scream that Kelly said made his legs shake uncontrollably. He was only 20 yards away. Kelly drew his bow as the bull walked behind some trees and as he stepped into the open Kelly made a perfect shot. Having never hunted, and never seeing anything get shot by his own hand, Kelly didn't know what to do. The bull didn't act like it was hit. Kelly said he knew that you don't chase an animal, especially if it was hit, but the urge to get another shot over took him and he stumbled a few steps trying to get another shot at the animal, which of course scared some of the animals and the big bull. He only ran ten more yards and fell over. Good thing Kelly missed that cow earlier in this hunt because the only thing running through his mind as he drew on this big bull was "pick a spot, pick a spot, pick a spot". 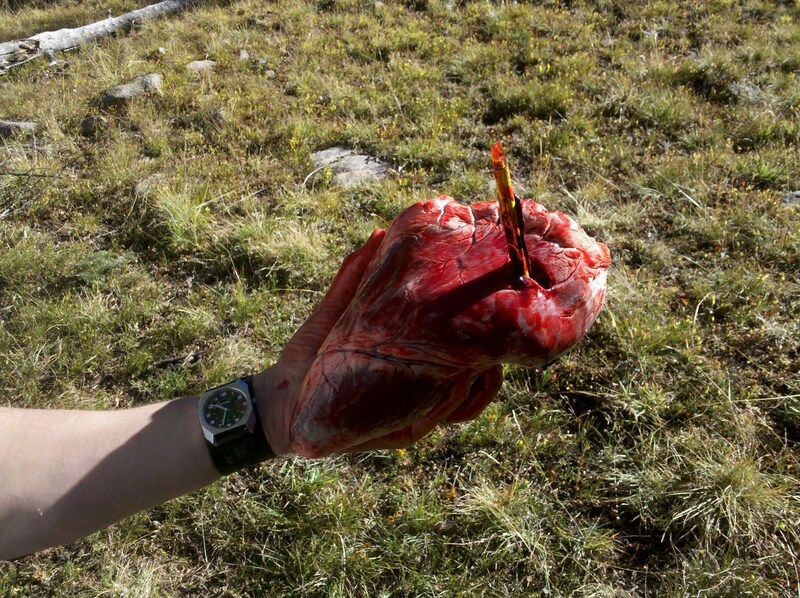 The top part of his arrow was lodged in the heart, exactly like this, when they dressed the bull. Since the llamas were packed down with two elk the guys had to carry out a lot of their own gear. Kelly's pack weighed close to 90 lbs and it took the guys about 4 hours to walk out - thankfully all down hill. Del shot that cow with a Spirit longbow, 48@28 but drawing around 30, and a Snuffer broadhead. 250 up front and arrow weight of around 625. His arrow was a CX Heritage 150. His blood trail was huge and she died very quickly. His arrow exited out the other side but did not pass entirely through. Kelly shot his bull with a Wapiti recurve, 64@28 and drawing 30.5, and a STOS broadhead. Kelly shoots 225 up front and his arrow weight is around 625. His arrow was a CX Heritage 250. Kelly's arrow was about 3/4 out of the other side and directly hit one of those big elk ribs. The feather end of his arrow was left stuck in the heart. The blood trail was massive...of course with a heart shot. Awesome post! Makes me want to go hunting and blow off work! Great to see you all hunting with traditional bows and hand made arrows! that is amazing!